Tim Lansing presenting the Roger Ward Memorial Award to his dad, Don. Don Lansing of the Grace Brethren Church of Norwalk, Calif., has been recognized with the Roger Ward Memorial Award, which is presented annually by Operation Barnabas, a ministry of CE National. This honor is presented to an individual or couple who most exemplifies the characteristic of ministry in service towards an Operation Barnabas team. 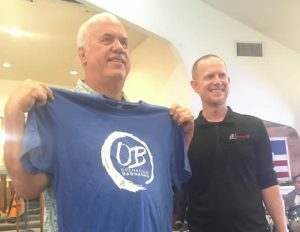 It is presented in honor of the sacrificial contributions of Roger Ward who, in 1979, gave generously to the OB team that traveled in California that summer. Below is a video of Timothy Kurtaneck presenting the award to Don.